Loveland Ski Area holds a special place in many locals' hearts because of its emphasis on the skiing and riding experience, offering options to welcome new skiers and challenge the experts. While Loveland may not be as strong as some of its neighbors on mountain services, it does extremely well where it focuses energy. The mountain takes the spotlight, offering a variety of trails for skiers and riders of all skill levels without the lines or expensive lift tickets. Nestled in the mountains within an hour drive from Denver, Loveland is consistently one of the first resorts to open and the last to close. 400 inches of annual snowfall provide an opportunity to ski the entire mountain without worrying about snow coverage. The mountain is divided into two parts, the Valley and the Basin. The Valley is focused primarily on new skiers, with the Ski and Ride School located at the base. The Basin is the larger of the areas, located on the south side of I-70, with more diverse terrain. Loveland Ski Area is located 53 miles west of Denver on I-70 at exit 216, directly on the east side of the Eisenhower Tunnel. 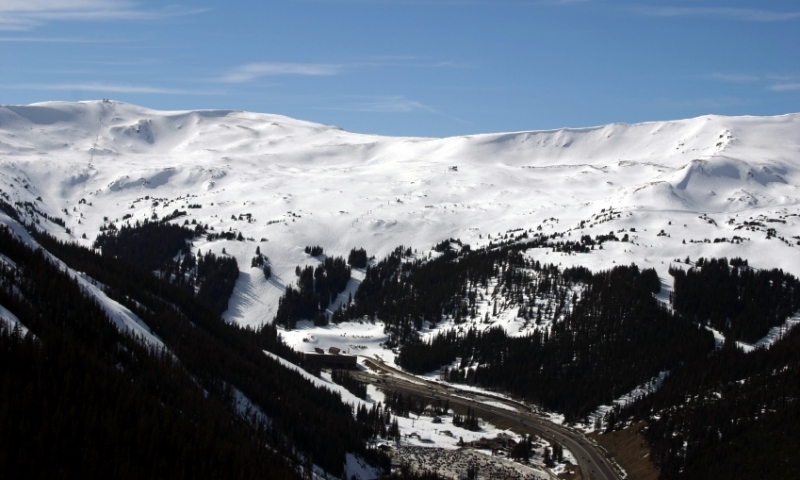 The Loveland Pass ski area, meaning the unpatrolled backcountry area, is located just 4 miles up the road from exit 216, on Highway 6. Parking and access are at the Continental Divide. Love Ski Area Colorado is generally one of the first mountains to open and last to close. The season usually runs from early October through early May. During the week, lifts open at 9am. On Saturdays, Sundays and Holiday Dates, the lifts open at 8:30am. Last chair rides are at 4pm. Shops and restaurants are scattered around the base, providing hats, sweaters, goggles and other equipment. Ski and snowboard rentals are available, as are repairs and tuning. In addition, the ski shop will be happy to let skiers and riders demo the new equipment on sale. Loveland provides free parking at both the Valley and the Basin. Shuttles are provided free of charge between the areas. Ski school and private lessons are available from the Loveland Ski and Ride School. The Loveland Nursery provides affordable childcare for the kids.